The staff at Waters of Tahoe Properties pride themselves on matching the perfect vacation home with each visitor to the area. With knowledge about the entire basin but expertise in the North Shore neighborhoods of Lake Tahoe, Waters of Tahoe Properties truly cares about their clients and their clients' needs. They also specialize in helping families with dogs find excellent vacation rentals for their Tahoe stay. West Lake Properties at Tahoe gives visitors to Lake Tahoe two decades of experience in sales and quality vacation rentals. Offering a full spectrum of ski leases as well as long-term and short-term rentals along the West Shore of Lake Tahoe, the intimate group of agents take the time to know each of their guests needs and wishes. 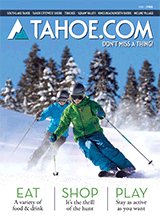 The team also provides services in sales in the Lake Tahoe Basin. West Lake Properties prides themselves in truly knowing the ins and outs of the Lake Tahoe vacation rental market, making each person's stay as fun and relaxing as possible.